Jasmine's nickname is Queen of the Night and Moonlight of the Grove. For eons Jasmine has been treasured for its beautiful fragrance. Jasmine absolute is uplifting and effective in restoring hope and cheer in times of hopelessness and nervous exhaustion. It helps reduce anxiety and apathy. 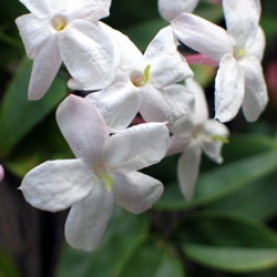 Jasmine also fosters self-love and connection to the angelic realm. It is considered to be an aphrodisiac aroma. Jasmine assists in connection and opening of the heart. It is highly valued in aromatherapy for its euphoric, sensual qualities. We import our Jasmine Infused Jojoba from our South African distiller. According to our distiller, the Jasmine flowers are delicately infused (using a very low heat process) into the Jojoba. Jojoba is not an oil, it is a wax, and its shelf life is indefinite, so there is no danger of this infusion turning rancid. Just like Jasmine absolute, the aroma of our Jasmine Infused Jojoba is floral, sensual, exotic, and uplifting.